If you have ever had your carpets cleaned in Tampa FL you know that you have several different cleaning methods to choose from. The most popular method for cleaning carpets is hot water extraction, sometimes called steam cleaning. This method consists of hot water being sprayed on the carpet and extracted back out. In most cases the hot water is sprayed at high pressure to blast away the dirt and soil. This can leave the carpet wet with too much water and long dry times. There is another option, it's called Chem-Dry. Chem-Dry uses a carbonated hot cleaning solution that is sprayed at low pressure for easy extraction. This cleaning method provides excellent cleaning results without over wetting the carpet. 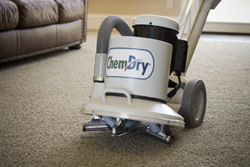 Chem-Dry of Tampa FL uses this hot carbonated extraction method to clean carpet and upholstery. It's more powerful than steam cleaning and dries in just two hours not two days. it's not steam cleaning is green cleaning. For not steam cleaning in Tampa FL call Chem-Dry of Tampa.